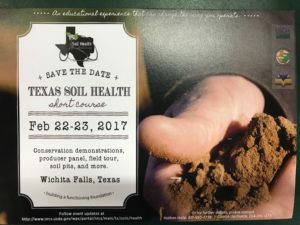 The Texas Soil Health Short Course will be held on February 22-23, 2017 at the Region 9 Education Service Center in Wichita Falls, Texas. The short course will offer the opportunity to gain a better understanding of soil properties including water infiltration, water holding capacity, and organic matter content. It is being hosted by the USDA-Natural Resources Conservation Service (NRCS), Texas State Soil and Water Conservation Board (TSSWCB) and the Association of Texas Soil & Water Conservation Districts (ATSWCD). The Texas Soil Health Short Course is designed to provide participants with research in dynamic soil properties and technical information about practical approaches to implementing a system to improve soil health. Conservation demonstrations and soil pits will showcase the functions of a healthy soil system and highlight its improved water infiltration, soil porosity, increase biological activity, and greater nutrient efficiency. The cost of registration is $100 for the short course and $40 for the field tour. For more information, please click here or call 254-773-2250. This entry was posted on Thursday, February 2nd, 2017 at 3:33 pm	and is filed under Events. You can follow any responses to this entry through the RSS 2.0 feed. Both comments and pings are currently closed.